Spoilers about Doomsday Clock #7 and my eyes. Long story short, I’ve had some recent health issues that, among other things, have been affecting my vision. No, I’m not blind or anything, but fine details and small print were suddenly out of my reach, to the point where I couldn’t read comic books (GASP!) and more importantly, couldn’t read things like, say, my weekly Diamond invoices or even the cover prices on comics. Like, even with my normal vision, I was having trouble making out cover prices set in that 2-point type some publishers like to use. But with recent events…feh. Anyhoo, not to worry, I’ll be fine, I’m having treatments and my vision has more or less normalized. I still need real glasses, and not these dollar-store readers I’ve been depending on, but that will have to wait until one of my eyes fully heals so it can be properly tested (another long story short: I had a hemorrhage in one eye, and it’ll take time for the blood in there to be reabsorbed). Thus, if you’ve noticed a preponderance of typos on the site of late, well, there you go. Not that life here on Progressive Ruin Isle has ever been totally relaxed and tpyo-freee, but now that my vision has recovered sufficiently improved functionality, I’m going back and noticing some egregious errors. I’ll fix ’em as I can find ’em, folks, so I appreciate your patience. Meanwhile, this means I have a pretty good sized backlog of new funnybooks to plow through and see what everyone’s complaining about now. The thing I don’t like about DC’s biweekly schedule for some of their books is that, even though I don’t take home all that much, even a slight delay in reading the new comics, and then suddenly BAM I’m like five issues behind on The Flash or whatever. Frankly, I’ll be glad when everything gets knocked back to monthly…it’ll be so much easier to keep up. I don’t mind some biweekly books, and the way things are going, that’s where DC is basically headed anyway. In fact, now that I’m thinking about it, there aren’t too many biweeklies left. Huh. This is it, The Big One, the issue where something finally seems to kind of happen, as Dr. Manhattan at long last makes his onscreen big blue appearance after like two something years of teasing. And yes, in answer to the question everyone’s been pondering, he does present the Full Manhattany, which would have been a first, I think, for a DC comic starring their establishing superhero characters if it weren’t for, well, you know. But all in all, a good year for penises over at Detective Comics Comics. As I’ve said in the past, I’m oddly fascinated by this series while also recognizing the issues with it. I don’t know, I feel like Doomsday Clock is totally going to Millennium it and the final issue will be the introduction of the new Watchmen superhero team with new member Tasmanian Devil and their new leader Cyborg. …Well, maybe not, but now that the can of Watchmen has been opened, seem unlikely DC will just try to shove ’em back in there. Oh, another specific point about this issue: wasn’t one of the points about Manhattan’s character originally that he witnessed what was happening around him but couldn’t act on it, that he was “a puppet who could see the strings,” resigned to the inevitability of the actions he’d relate from the past? That the entire premise of Doomsday Clock and how it all relates to DC’s “New 52″/”Rebirth” universe(s) is based on him changing something he’s observing in “the past” (which for him is just as “present” as “the actual present” due to his unique perspective unbound by linear time) seems…a bit odd. I mean, I suppose technically one could extrapolate Manhattan’s ability to change things in the past at various points in the timeline as he experiences it, but…that seems contrary to how he’s presented in Watchmen , where he’s locked into a pattern he can’t change, only observe as he exists through it. But then again, at the end of Watchmen he seems to be more willing to fiddle with things, so maybe “let me go into what you normies think of as ‘the past’ and futz it up a bit” could come from there. Then maybe he can dip into his own past and prevent that guy from stepping on that watch, preventing the whole accident that made him Dr. Manhattan in the first place. You know, so long as we’re low-end Quantum Leap -ing things in this joint. 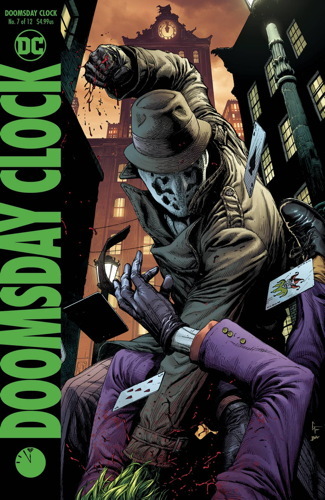 So anyway, Doomsday Clock , it remains a thing. I was going to cover a few other recent books, but…well, let’s save that for next time. I suspect that at some point, Dr, Exposition will explain that his exposure to the Multiverse revealed that timelines were not immutable, and could even be spliced together, blah blah blah. I don’t know how far back they’re claiming his tinkering goes. They may just be invoking him for Heroes Reborn the New 52, I rather like the notion that he’s been nudging things since just after the Crisis, and his meddling is responsible for the worst excesses of the Iron Age. Sorry to hear about your eye, but it’s weird – kind of the same thing happened to my retailer recently, and he’s still recovering. He also had a hemorrhage in one eye, and he’s getting treatment. Maybe all you comic book guys are like medieval monks, trying to read tiny type in the gloom too much? I hope you’re better soon, sir! This is a heckuva long setup just to get to a panel at the end that shows Dr. Manhattan’s hands as the creator of the universe. I haven’t been reading it, what with the whole “we’re screwing Alan Moore out of his characters for good” vibe. Is it good? Should I consider picking it up? Or…well, is it a lot of “we’re screwing Alan Moore out of his characters for good”? Well, I don’t suppose there’s any danger of Doomsday Clock ever going biweekly, is there…? I quite enjoy DOOMSDAY CLOCK, which is a lot better than I ever expected it to be. As for screwing over Alan Moore… look, the guy is a wonderful writer, there’s no doubt about that. But his work has often been based on the work of others. He’s a genius, but a derivative one. So I’ve never understood why people get outraged at the idea of DC revisiting characters he created. Half his most famous stories wouldn’t exist if he hadn’t revisited others’ characters. Heck, this even applies to WATCHMEN. Hope you get better soon, Mike! In the meantime…maybe some large print Nancy or Swamp Thing on tape? That is being very generous to Moore. For me personally, there’s just no way of getting around the fact that Moore doesn’t want DC to keep doing so, so even if it’s legal, even if they can justify it to themselves or others, it’s just basically not cool of them. That is, of course, exactly how Lovecraft and Moore both talk, by the way.